Amy has over 25 years of experience as a chef. Her interest in cooking began during restaurant work in high school and her passion for food began at birth. 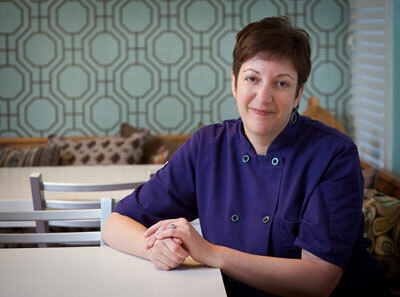 Her enthusiasm for creating and appreciating well-prepared food sent her to culinary school. She attended the Culinary Institute of America (CIA) in Hyde Park, New York. Immediately after graduation in 1988, she worked at the CIA as a fellowship. She has worked as a pastry cook and chef at the five-star Boca Raton Resort and Club in Florida, The Intercontinental Hotel in New York City and at EuroDisney in France. After returning from France she was the chef at a Chestnut Hill restaurant called Pollo Rosso. In 1996, she started a small catering business and sold it to buy The Night Kitchen Bakery in 2000. Amy and John were asked to cook brunch at the James Beard House for guests in April of 2013 which was a huge success and tremendous honor. Amy has appeared on Philadelphia’s NBC affiliate, the 10! Show, numerous times to demonstrate everything from Halloween ghost cupcakes to sweet potato pie for Thanksgiving. She has also appeared on CN8’s Your Morning, Fox News and Seeking Solutions with Suzanne. Amy grew up in the Mt. Airy section of Philadelphia and attended the Philadelphia High School for Girls. Her love of the area and commitment to environmental issues led her to create a grassroots community organization called GReenINChestnutHill (GRINCH) . Amy married chef John Millard in 2002. Shortly after they married he began running the bakery with Amy. John and Amy adopted a little girl named Izabella (7 years old) in February 2011. She is looking forward to running the bakery one day. John Millard, a graduate of the University of Illinois, has honed his craft in such kitchens as Cafe Max in Florida as well as the White Dog Cafe and Odeon in his adopted city of Philadelphia. After marrying Amy in 2002, John joined the Night Kitchen Staff. 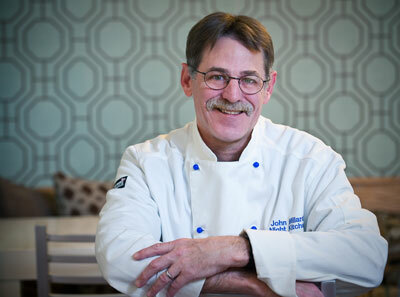 A motivated self learner, John easily adapted his savory cooking skills to baking. John bakes the cakes, cookies, pies and prepares the cake fillings and icings. John has delivered the majority of wedding cakes and large specialty cakes over the years. John has two sons, Andrew (24) who graduated from Lehigh University and Danny (20) who attends Temple University. John’s love of technology led him to create the Night Kitchen, Facebook Fan Page,Twitter and Instagram accounts.